He recibido un comentario a nuestro artículo sobre la metodología ASAP: "Alguien sabe si existe algún tipo de curso y/o certificación de Metodología ASAP?" 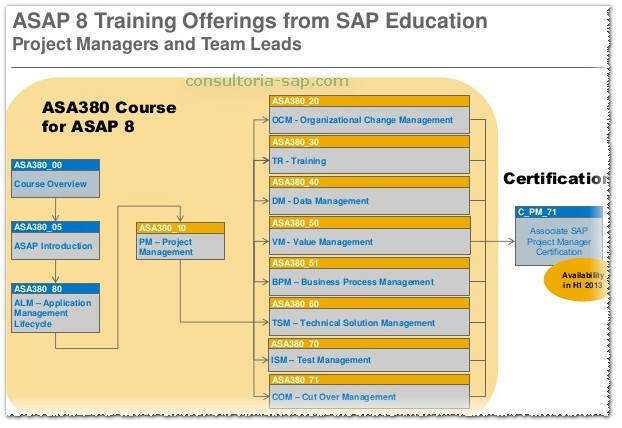 y me parece importante destacar que sí existe el curso dedicado a ASAP, aunque creo que la certificación no es propia de ASAP, sino que está incluido el tema dentro de la certificación del módulo "Solution Manager" (conocido como SOLMAN). Como el curso está disponible únicamente en ingles, les dejo el resumen del mismo en ese idioma. In this module we will focus on providing an overview of the ASAP Methodology for Implementation. We will start with the outline of the rationale for the methodology, its benefits and then we will proceed to discuss the taxonomy of the methodology with special attention to the structure of the information you can find in ASAP. In this unit we'll focus on the Application Lifecycle Management (ALM) Work Stream in the different phases of an SAP implementation project. First we will introduce the SAP Best Practice-thinking with regards to Application Lifecycle Management and then look at the purpose and the key deliverables of the ALM Work Stream in the ASAP Methodology. Then, we will discuss ALM-related tasks in implementation project phases. The third chapter deals with ALM in the Operate phase. Finally, some additional information will be provided as we complete this module. In this unit we'll focus on the Project Management (PM) Work Stream in the different phases of an SAP implementation project. PM deliverables related to initiating standard ASAP projects, all applicable to the Project Preparation phase. And PM deliverables relevant for the planning of future steps, applicable to Go Live Support and Operate phases. Chapter 5 deals with Agile ASAP, first introducing agile concepts from a general perspective and then explaining the differences between standard ASAP and Agile ASAP. Agile ASAP is only explained as part of the PM work stream lesson of this course about ASAP Methodology for Implementation in Detail as all "agile only "deliverables and tasks are assigned to the PM work stream. But as we will see later, some tasks part of deliverables of the work stream Training, Value Management, Business Process Management and Technical Solution Management are also defined as AGILE ASAP relevant and therefore influenced by how the project management is executed. Finally, some additional information will be provided as we complete this module. In this unit we'll focus on the Organizational Change Management work streams in the different phases of an SAP implementation project. First we will have a look at the purpose and the key deliverables of the OCM Work Stream in the ASAP Methodology. Then, we will discuss OCM in each of the ASAP Phases, Project Preparation, Blueprint, Realization, Final Preparation, and Go Live Support. Some additional information will also be provided as we complete this module. In this unit we'll focus on the Training Workstream in the different phases of an SAP implementation project. We'll start at a high level, discussing the purpose and deliverables of the Training Work Stream. In addition, we will provide some general training-related information for the project manager. In this unit we'll focus on the Data Management work stream in the different phases of an SAP implementation project. Data Management in ASAP combines deliverables and activites related to Legacy Data Migration and Data Archiving. The first chapter gives an overview of the Data Management work stream, it's place in the ASAP methodology, main deliverables and data management project specific roles. The following chapters, 2 to 5, describe the Data Management deliverables within each phase of the ASAP methodology. The last chapter contains links to additional material that can by accessed by you to deepen your understanding of Data Management. In this unit we'll focus on the Value Management Work Stream in the different phases of an SAP implementation project. The first chapter gives an overview of the Value Management work stream, it's place in the ASAP methodology and main deliverables. The following chapters, 2 to 4, describes the Value Management deliverables within each phase of the ASAP methodology. The last chapter contains links to additional material that can be accessed to further your understanding of Value Management. In this unit we'll focus on the Business Process Management work stream in the different phases of an SAP implementation project. Some of the main deliverables being the creation of the Blueprint document, the Solution Transformation Design and following realization of all solution components, being it SAP Core applications, enhancements or SOA-based composite applications. The first chapter gives an overview of the Business Process Management (BPM) work stream; the second chapter gives some more information about the BPM approach. The following chapters, 3 to 5, describe the Business Process Management (BPM) deliverables within these phases of the ASAP methodology. The last chapter includes a BPM summary and links to additional material that can be accessed to further your understanding of Business Process Management (BPM). Some of the main deliverables being the creation of the Blueprint document, the Solution Transformation Design and following realization of all solution components, being it SAP Core applications, enhancements or SOA-based composite applications. Note: "Value Management" is a closely related topic, and a separate Work Stream in ASAP. In this unit we'll focus on the Technical Solution Management work stream in the different phases of an SAP implementation project. The first chapter gives an overview of the Technical Solution Management work stream, its place in the ASAP methodology, main deliverables and Technical Solution Management project specific roles. The following chapters, 2 to 6, describe the Technical Solution Management deliverables within each phase of the ASAP methodology. The last chapter contains links to additional material that can be accessed by you to further your understanding of Technical Solution Management. In this unit we'll focus on Test Management work stream in the different phases of an SAP implementation project. The first chapter gives an overview of the Test Management work stream, its place in the ASAP methodology, main deliverables and Test Management project specific roles. The following chapters, 2 to 5, describe the Test Management deliverables within each phase of the ASAP methodology. The last chapter contains links to additional material that can be accessed by you to further your understanding of Test Management. In this unit we'll focus on the Cut Over Management work stream in the different phases of an SAP implementation project. The first chapter gives an overview of the Cut Over Management work stream, its place in the ASAP methodology, main deliverables and Cut Over Management project specific roles. The following chapters, 2 to 4, describe the Cut Over Management deliverables within each phase of the ASAP methodology. The last chapter contains links to additional material that can be accessed by you to further your understanding of Cut Over Management. Acabo de verificar el enlace y sigue funcionando. Si necesitas descargar algún manual de SAP, por favor ingresa a nuestra comunidad de SAP (foros.consultoria-sap.com) y después de presentarte y leer las normas, pide lo que necesites., saludos!